Surf's up at Ramen Halu, a Pacific surfing-themed ramen restaurant in San Jose, where our adventurous band of Ramen Lovers enjoyed numerous bowls of ramen over the Thanksgiving holiday. We were at first discouraged by the large crowd of people waiting outside the restaurant, but as it turned out, they were just waiting for the restaurant to open for the day. If you're planning a visit, make sure you take note of Ramen Halu's non-standard operating hours. Ramen Halu serves three types of broth. Halu is a rich, dark, pork-flavored broth with thick noodles, Sho-yu is a soy sauce broth with thin noodles, and Shio is a light salty broth with thin noodles. After selecting your broth type, feel free to add on extras like pork, egg, green onions, nori (seaweed), spinach, bamboo, mushrooms, or corn - or, choose from one of Ramen Halu's favorite combinations listed on the menu. If you're feeling indecisive (or very hungry), go for The Works, which comes with an entire plate heaped with a variery of colorful veggie toppings. We especially liked the green onions, which were crunchy and fresh, and the egg boiled in soy sauce, which was perfectly cooked to be just slightly runny on the inside. The Halu ramen is extremely fragrant and delicious. Flavorful pieces of pork enhance the broth, while veggies provide color to the eye and texture in the mouth. The thicker, chewy noodles are wonderfully complemented to the rich broth and taste reasonably fresh. This is not the choice for a health-conscious consumer - be prepared to see small globules of pork fat floating in the thick and delicious soup. (Note: Ramen Halu's dishes can be ordered with less or more fat and salt.) Nevertheless, the Halu ramen is the restaurant's namesake dish and we can definitely see why! The Sho-yu ramen is not as fatty as the Halu ramen, but still has a wonderful soy sauce flavor that is quite distinctive without being too salty. The thinner noodles are better suited to this lighter broth and have a delicate yet chewy nature. 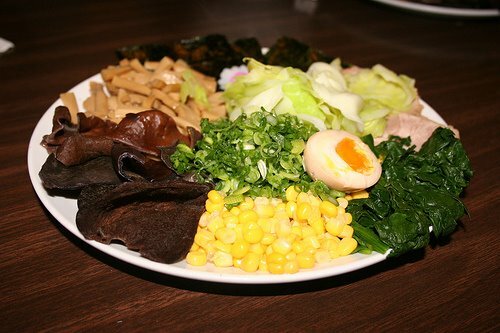 Feel free to load the Sho-yu ramen with lots of toppings if you want the broth to have some extra texture, since it is a much thinner liquid than the Halu broth. Portion size is generous for a single person. Prices are steep compared to other ramen restaurants (The Works will set you back around $13), but the quality of the ingredients makes up for at least some of the price difference. On the basic ramen, the extra toppings are generally one dollar each, which can add up quickly if you're going for variety. However, the chef is generous with the toppings, so you'll at least be getting a decent amount added for each topping! Super Noodles are available under the Batchelors brand name in the UK and McDonnells name in Ireland. 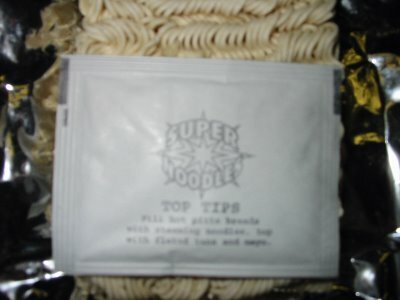 As you can see from the packaging, my Super Noodles come from Ireland, brought to me by Rebecca. In general, flavors for processed foods in the UK and Ireland seem to be stronger and more adventurous. So, there are flavors of Super Noodles that you would never see in the US, such as Spaghetti Bolognese and Southern Fried Chicken. 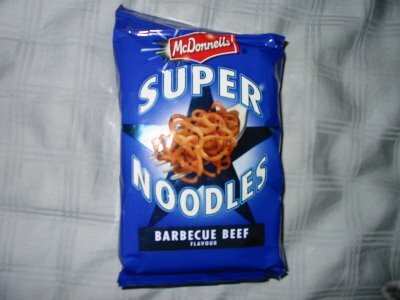 This particular package of Super Noodles is Barbecue Beef flavor, which happens to be Rebecca's favorite. I was amused to note that there is a mini-recipe printed on the "flavor sachet". It's hard to read from this blurry picture, but the Top Tip is "Fill hot pitta (sic) breads with steaming noodles. Top with flaked tuna and mayo." I presume that there are a variety of Top Tips so that you get a new one with every Super Noodles that you eat. Clever idea! Cook noodles in boiling water until soft. Drain almost all water but leave a little bit. Mix in flavor sachet and stir well. As you can see, the noodles came out looking delicious! These noodles contain only a flavor packet, and no vegetable or oil packet. The flavor of these noodles is fairly strong and tastes like a mixture of beef, Worcestershire sauce, and barbecue sauce. I guess it lives up to its name! This is a rather basic ramen like Top Ramen, but definitely comes through with better execution. Everything about Super Noodles exudes quality, from the shiny blue packaging to the neatly arranged flavor sachet within the package. While the noodles by themselves are somewhat plain, they would very competently complement additional vegetables and/or meats. The flavor is quite interesting, and not something that you would be able to find easily in other brands. If I could make a change to these, I would keep the flavor and add some dried vegetables to add some texture and variety. 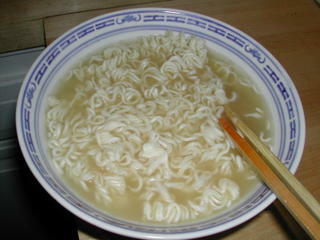 1) It is 120 grams instead of 100 grams like the typical ramen. More weight means a more filling meal. I ate this two days ago when I was very hungry. 2) Sometimes you're just looking for a hot and spicy soup and a "meat" flavor is optional. This flavor is extremely potent! 3) There are tons of dried veggies in the packet. 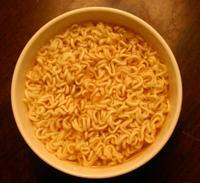 4) The ramen shape is round, which means it fits nicely into my microwaveable bowl. 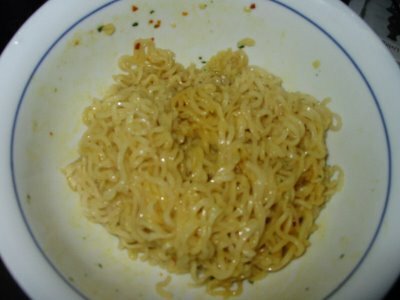 5) The noodles are at least hefty and chewy; better than some other brands. I recommend putting in just half of the spices packet and all of the veggie packet. Even though this ramen is very spicy, it's still one of my favorites. 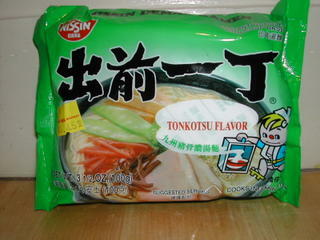 What is Tonkotsu flavor? Curiosity drove me to try this particular brand of ramen, despite the general mediocrity of the Nissin Demae product line. As it turns out, Tonkotsu flavor is tasty! The package comes with a seasoning oil packet and a spices packet. 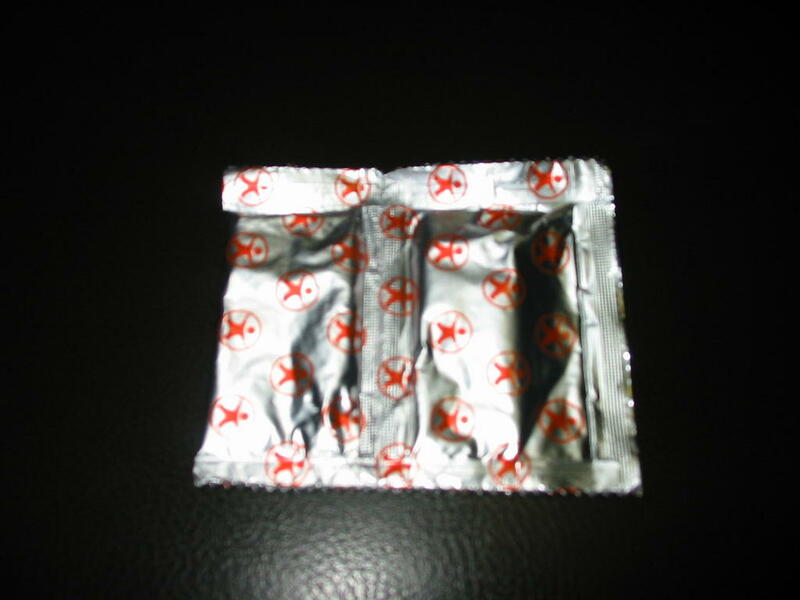 The overall flavor is similar to sesame, and the spices packet includes sesame seeds. So if you like sesame, this flavor is for you! 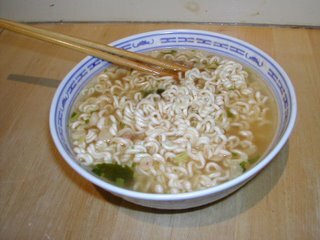 Of course, the sesame broth did little to mask the tasteless filler that Nissin likes to call "noodles," nor did it include dried veggies or other spices to give the flavor some kick. Still, it was more flavorful than the pork flavor and different from any other ramen I've ever tried. 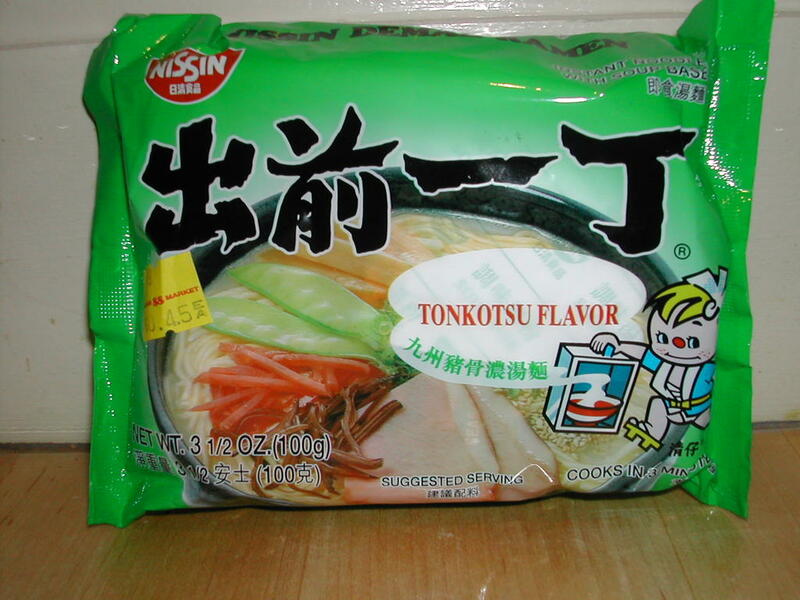 Interesting, I did a quick Internet search for Tonkotsu, and it's supposed to be a pork, onion, and garlic flavor. 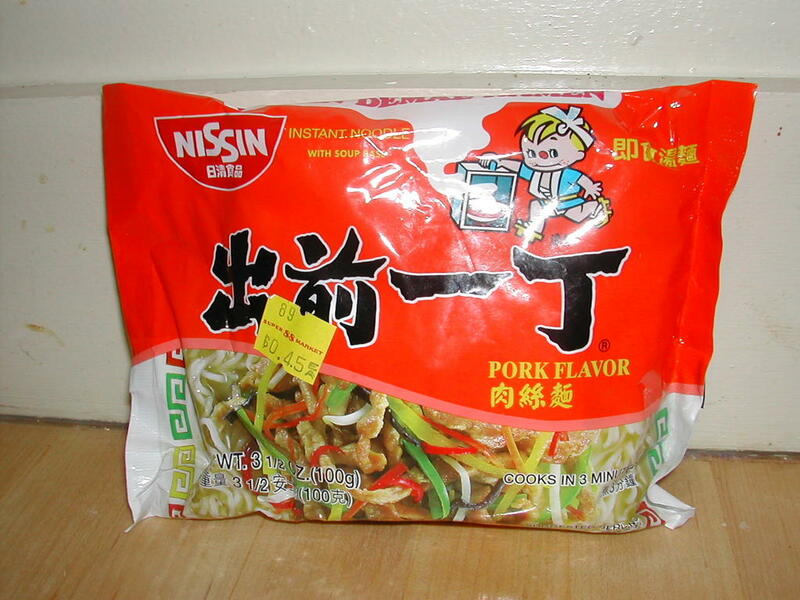 Not much like Nissin's Tonkotsu flavor! 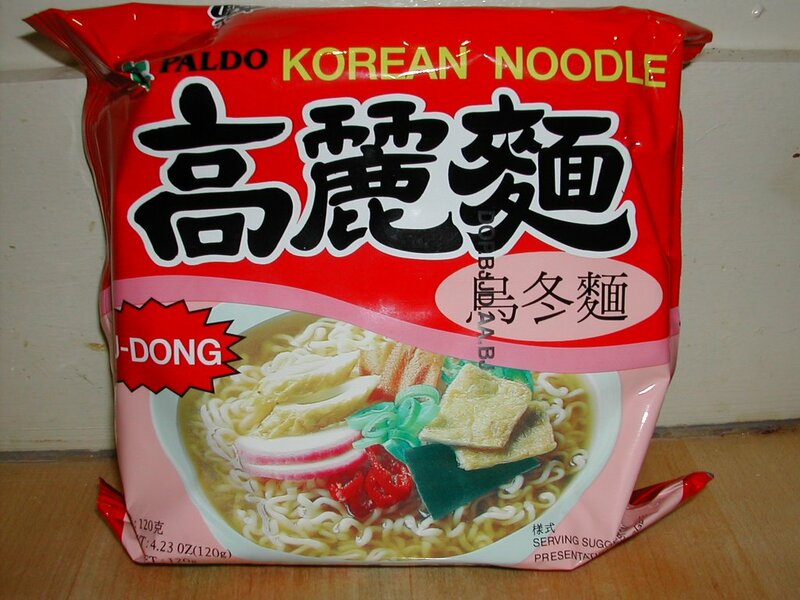 The Six Fortune U-DONG Noodles is a Korea product. The Korean made Ramens have bigger packages than most others. They often come in as a 4.2oz (120g) packge compares to a 3.5oz (100g) package for most of the others like Nissin's. That is a good 20% more. So if you're hungry, this will do a better job filling you up. 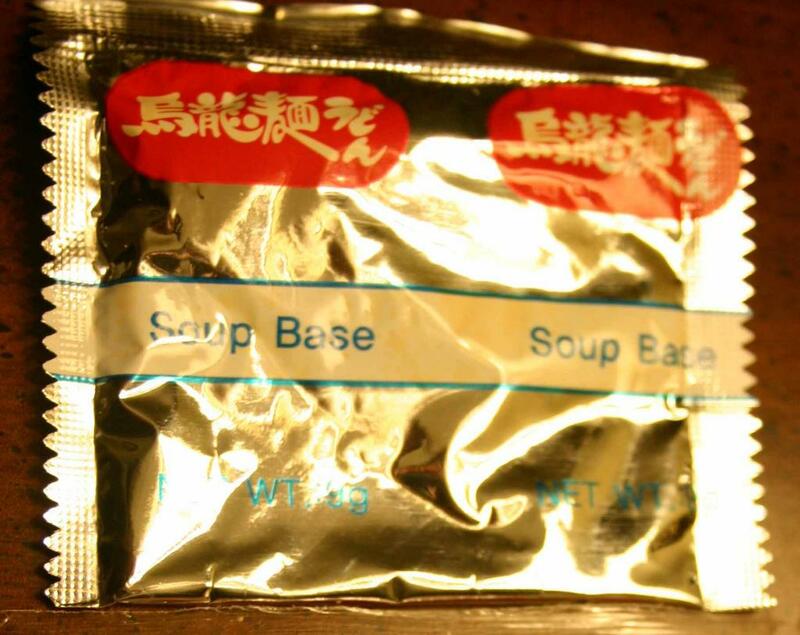 There are 2 soup base pouches inside each package. One pouch provides most of the flavor which appears to be heavily miso or soybean based with a touch of seafood flavor. 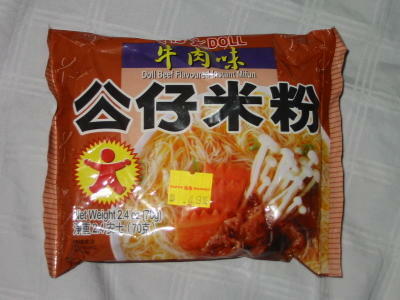 It taste like most of the other Korean made ramens except this one is not spicy hot. The other pack provides some dried carrots and seaweeds. 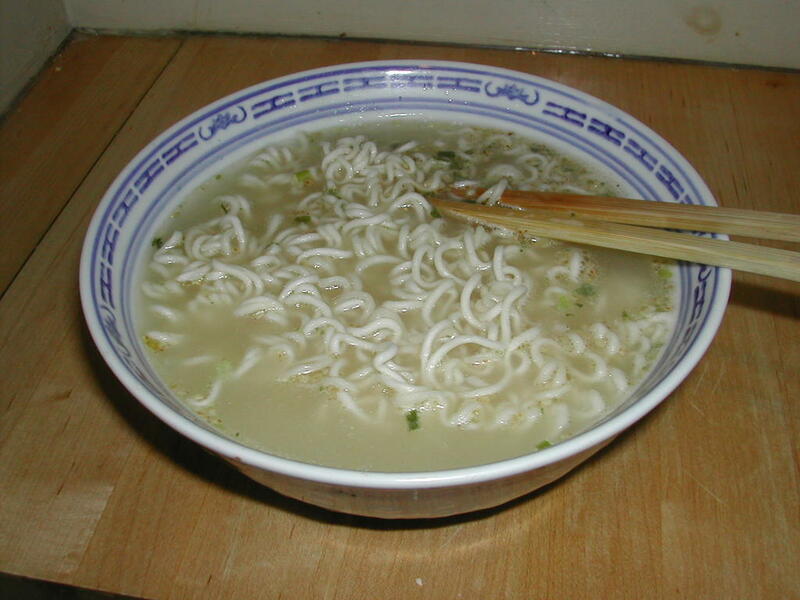 The texture of the noodles also appears to be the same as all other Korean noodles. Korea must be a very homogeneous country and everyone there have the same taste. I like to overdo my Korean ramens somewhat. Reading from instructions on the package, it also advise you to "Quick cooking in 3 minutes". By that, I take that the manufacturer w ould like you to cook it instead of just add hot water to it. You may still get the same result by adding hot water, only you need to leave it in the bowl a little longer, say 10 minutes. You may even want to heat it up in a microwave oven before eating because by the time it's ready, it may already cool off somewhat. Since I like Korean ramens, I'll give it a favorable rating of 8 out of a possible 10. 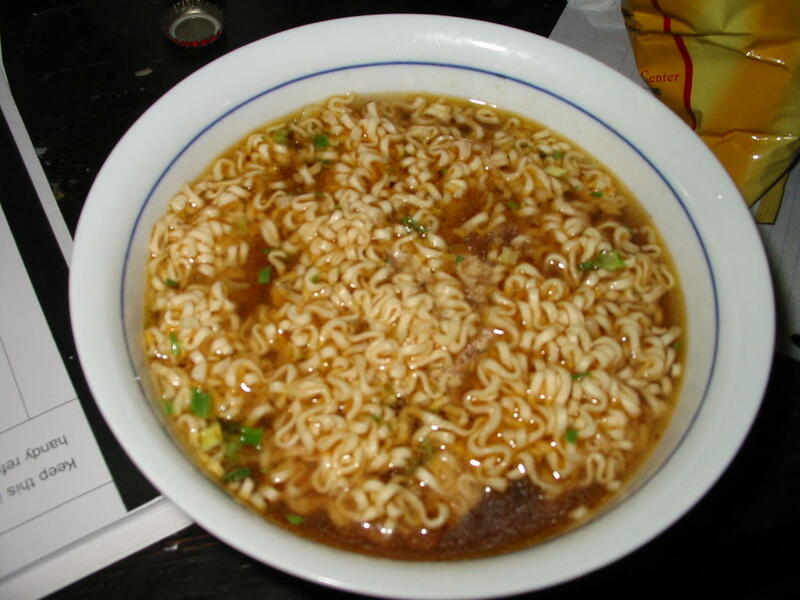 I do think all korean ramens tastes alike, on both the soup flavors and the texture of the noodles. Your choice among the Korean noodles is basically spicy hot or not. Either way, I don't mind eating it often. 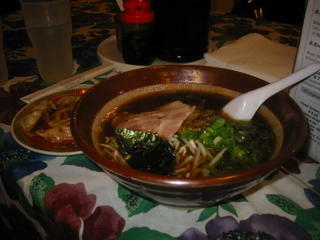 I've previously blogged about Sapporo Ramen's soy sauce ramen. On our latest trip, we ordered Jon's favorite, the miso moyashi ($8.75) with extra noodles ($1.75). We forgot the digital camera, so no pictures, sorry! The miso moyashi comes with ground pork and heaps of Chinese vegetables, including bean sprouts and Chinese broccoli. The ratio of meat to veggies to noodles is quite good, although the extra noodles are so absorbent that the broth can run out quickly. It is probably okay without the extra noodles. 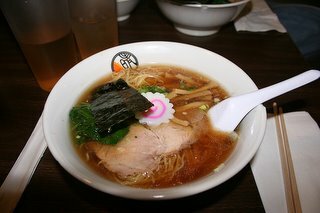 The broth is miso-flavored, which has a very light taste and is good if you are looking for something subtle. The chewy noodles are a better accompaniment to the miso flavor than the soy sauce flavor because the noodles are also light and somewhat tasteless. 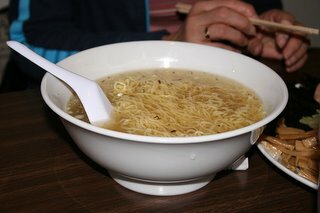 But the noodle texture does provide some nice heft to the soup. Jon adds garlic, chili paste, and vinegar to his soup, which gives it more flavor. I like to stay true to the purity of the ramen. With the extra noodles, we both ate our fill for dinner and had two servings leftover for lunch the next day. A great deal and a nice bowl of noodles! As I ate these noodles, I had to ask myself, "Where's the beef??" Doll Beef Flavoured Instant Mifun is another uninspiring part of Doll's insipid noodle lineup. I had high hopes for this one, mostly because it's pretty difficult to mess up mifun. Also known as "rice sticks", mifun is made out of rice (duh!) 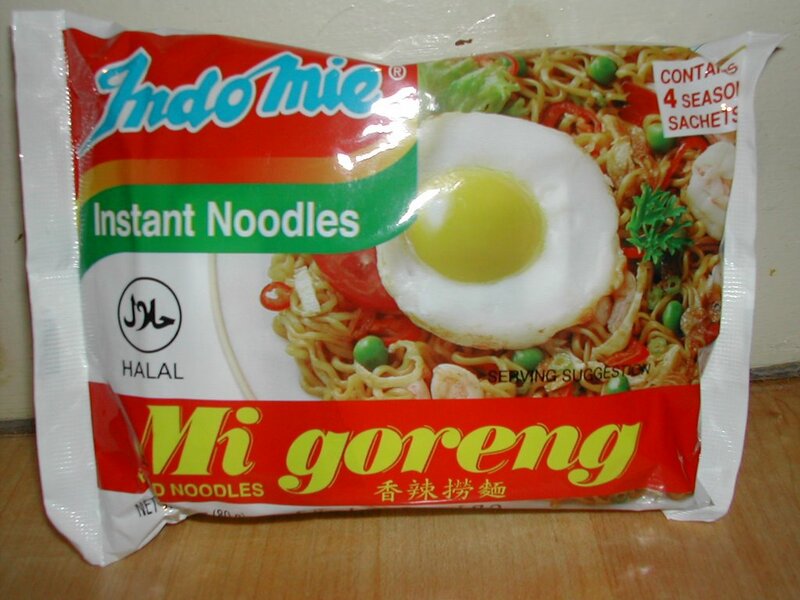 and is much thinner than regular ramen. 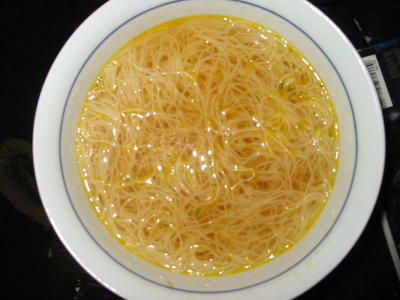 It is similar to the noodles used in pad thai. Although mifun is thinner than ramen, it takes longer to cook, because the noodles are capable of absorbing more water than ramen usually absorbs. The flavor packet for these noodles was actually two connected packets. I've never seen this before, and I'm not sure if it was an intentional design or if the company is too lazy to cut apart their flavor packets. It is very difficult to use it without splitting it into two, so I had to end up cutting it apart anyways. 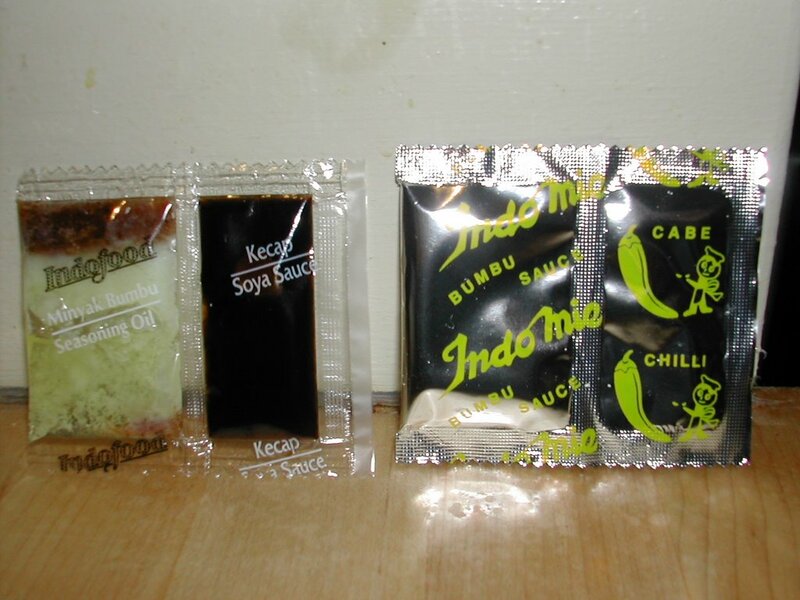 One of the packets contains a pretty disgusting looking yellow curry paste, and the other packet contains the standard flavoring powder. Hmm, doesn't look too bad from the picture, huh? Well, it didn't taste horrible, but there was pretty much no flavor besides 'salt' in this bowl of noodles. I didn't get any hint of beef, in fact, these noodles tasted more like chicken than beef. 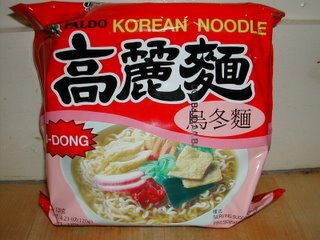 That leads me to wonder if the manufacturer actually put in the wrong flavor packet into these noodles. It's pretty difficult to mess up mifun, because they are naturally quite flavorful and have a good texture to them. The Doll Mifun isn't terrible, but lacks any sort of impression, either good or bad. The failure of the noodles to live up to their labeled flavor is disappointing and misleading at best. My recommendation is stay away from the Doll brand; there's nothing I've seen from them that has impressed me. Hours: Mon. - Sat. noon-9 p.m.; Sun. noon-8 p.m. Unlike California, Boston has very few restaurants that serve ramen. One of the few in the area is Sapporo Ramen, located in the Porter Exchange Building food court. It's a decent bowl of ramen but nothing spectacular. Be prepared to fight for your seat - there are only three picnic-style tables with about six seats each. You'll have a decent chance on weekdays, but forget about it on Friday or Saturday night. Once you're seated, you have the choice of three different broths - soy sauce, miso, or clear (which I presume is the base stock. Either that, or steroids). Each of these broths has five or so versions with different meats and veggies. Jon usually gets the miso moyashi with ground pork and veggies. Last night, we decided to try the "normal" flavor of soy sauce standard, which comes with roast pork, bamboo, bean sprouts, scallions, and nori for $7.25. The broth was very tasty and I liked the presentation, with heaps of scallions and an artfully placed seaweed strip. The service was excellent and fast, considering there's just one waitress. However, the noodles were nothing special and the "roast pork" was really just boiled pork slices. The bean sprouts provided a nice crunch, but the bamboo appeared to be rehydrated when I was expecting fresh or canned. Also, the serving size is ample for one person, but not enough for two. Next time if you're sharing, get the extra noodles for $1.75, and you'll have enough for about four servings. In summary, it's a nice bowl of noodles and easy to get to, but nothing really amazing or delicious. I suppose that we in Boston have to take any ramen we can get. Nissin Demae is a fairly popular brand of Asian ramen, although I usually get the beef flavor. This time, I tried the pork. 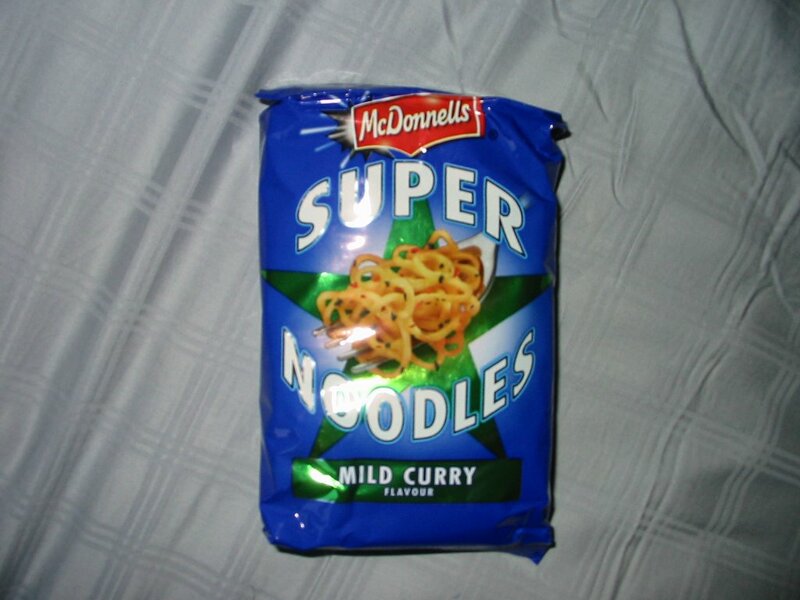 As you can see, the noodles are fairly standard. They did not absorb much flavor, but the texture was nice and overall did not really improve or detract from the overall ramen experience. The broth was really tasty! Subtle yet robust flavoring, and a change of pace from the usual in-your-face barrage of spices. My only complaint, however, is that there was no hot oil packet or little bits of veggies. I really like the little bits of veggies for the color and taste. 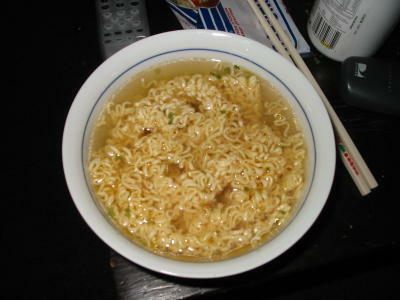 As you can see, the cooked ramen looks rather bland, although the broth is actually quite flavorful. This is a good choice if you are looking for a basic ramen to warm you up on a cold rainy afternoon. Look elsewhere if you want something spicy or with a strong taste. I was a little confused when I saw the packaging to whether this was "Vedan" or "Veoan". But upon reading the label on the back, turns out it is actually "Ve Dan", based in Taiwan. 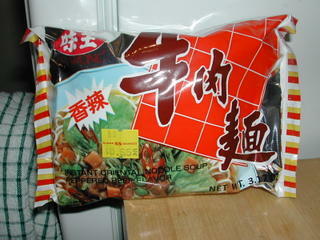 Like most Taiwanese ramen, the Ve Dan noodles are slightly thinner than other types and are crispier. Inside were two packets: one with dehydrated green onions/cabbage/spices and one with oil. I was very pleased with the amount of green onion and cabbage in the ramen. You can't really tell from this picture, but there were quite a few of these veggies that plumped up once they soaked in some water. I like them in my ramen because they add variety in terms of color, texture, and taste. The Ve Dan was overall a bit bland, and a bit disappointing. Of course, it puts the American brands like Maruchan and Nissin to shame, but it still is not a top tier imported ramen. 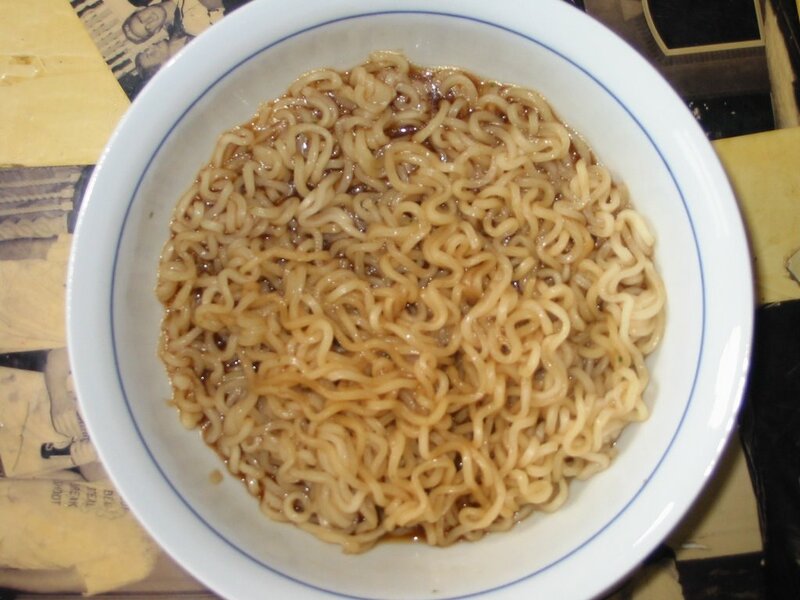 Still, a good basic ramen that would be good for recipes, if you like making more elaborate food out of your ramen! Since we moved to our new house last weekend, my ability to cook an actual meal has been slightly diminished due to the fact that I can't FIND ANYTHING. On the plus side, you are awarded with my first instant ramen review. 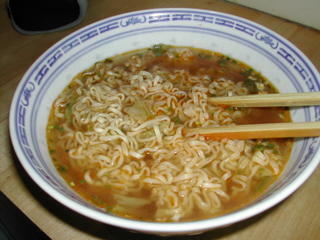 Shin Ramyun Hot and Spicy flavor certainly lives up to the billing. Klint typically puts the whole packet of seasoning in while I tend to go with three-quarters of the packet just so I can still feel my mouth after all is said and done. Regardless, this ramen flavor is spicy enough to induce sniffles in even the hardiest of souls. Unfortunately, for the more discriminating ramen eater, there's not much flavor other than spiciness. No beef flavor, no crappy shrimp flavor, nothing. Even the freeze-dried vegetable packet doesn't add much other than color. You'll notice in the picture that I do go the extra step and add a poached egg to my ramen. It's all about balancing this oh-so-nutrious meal with protein. As for the noodles, they're pretty standard ramen noodles. Since the soup is so spicy, the noodles absorb the hotness too. Generally you'll have to settle for eating the noodles by themselves since the soup is not really worth drinking. That is, unless you're Klint and you'll eat anything as long as it scorches your tongue and burns a hole in your stomach. This brand of ramen was the preferred staple in the Lin household growing up, and I now understand why. Everything was well thought out, even down to the convenient notches already placed in the seasoning packets. The soup flavor was excellent, with a rich spicy flavor and with lots of little veggie things. I know ramen is bad for me, but the abundance of dried veggies makes me feel a little better. The noodles are soft and highly absorbent - I recommend allowing more than the usual soaking time in order to bring out their full flavor. The picture was taken shortly after microwave removal. 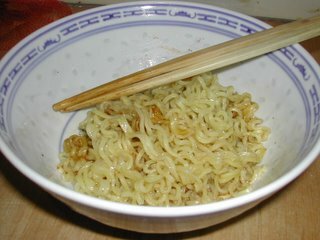 After another few minutes, the noodles had fully expanded to cover the entire bowl. 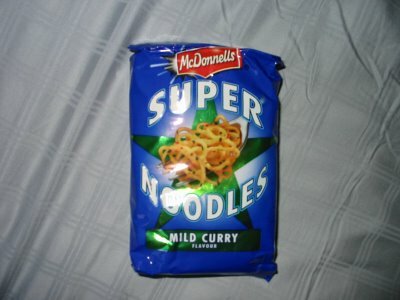 The only negative is that the noodle packet is rather small (although the same net weight as other brands). Combine this with the soft, melt-in-your-mouth quality of the noodles and I had to supplement this meal with other food items (or maybe that's just my being hungry as usual). P.S. I noticed in my ramen bag o' tricks that I have the same shrimp noodle that Alvin hated. Oh well. First of all, let me start off by saying that the bowl of ramen pictured on the packaging does not look very appetizing at all. There are two gigantic shrimps with the heads still on, which is the style that they are generally served in Asia. But the shrimps in the pictured bowl are absolutely puny. At least they could have put some appetizing shrimp in the picture! The font and color scheme is outdated and looks like something from the 1940's. I was equally unimpressed by the contents of the package. The block of noodles was rather small. Two seasoning packets were included, a small one with the flavor powder and a surprisingly large packet containing flavored oil. Upon opening the seasoning packet, I was pleasantly greeted with the aroma of shrimp. The block softened and broke apart rather easily in the soup, which is not always the case. However, I definitely consider it a positive when the noodles can disintegrate from their block form in a reasonable amount of time. The oil package was absolutely huge! I have no idea why, because it's not like it was spicy oil or even particularly flavorful. It tasted like a combination of sesame oil and olive oil and didn't taste particularly good. 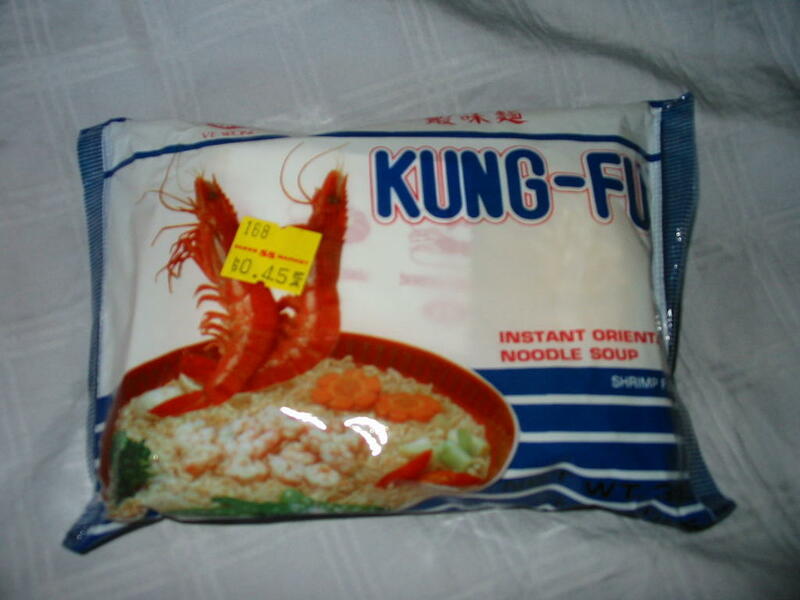 Somehow, when I started eating the ramen, the entire shrimp flavor was missing. I know I had smelled it when I had put in the seasoning packet, but it was completely overwhelmed by the oil. 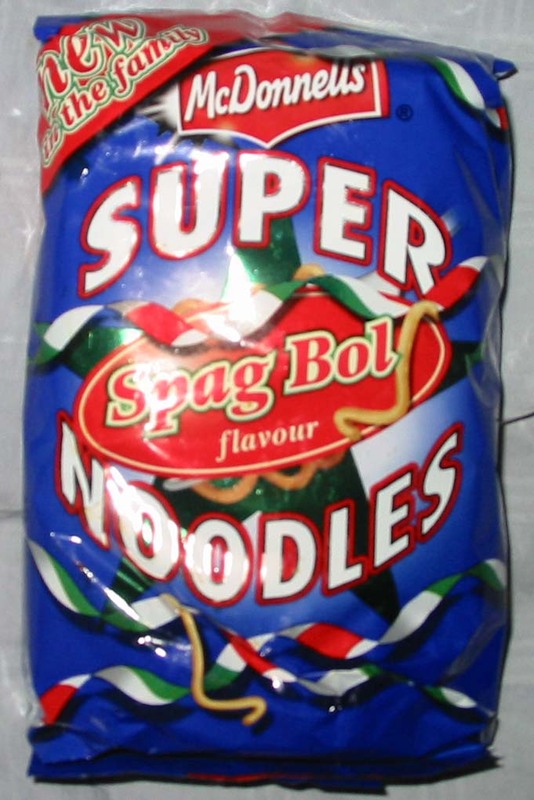 The noodles themselves were passable, but still not as good as some other brands. Those brown spots in the picture are shadows, not fried red onions. 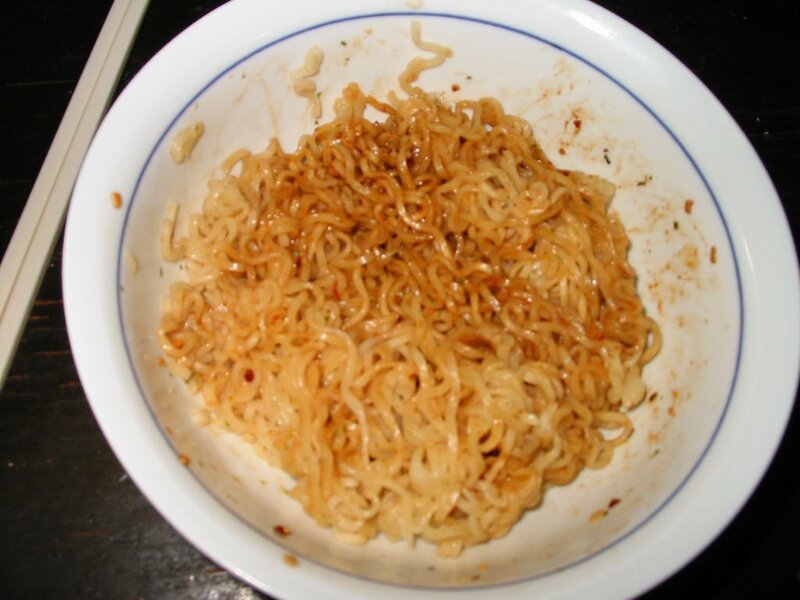 This is a shame, because this ramen could definitely have used something to add some flavor besides oil! I am not a frequent shrimp flavor eater, and I can only hope that other shrimp flavored ramen doesn't taste this bad! 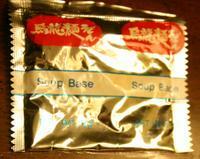 Soup: The soup base was a mixture of powder and hot sauce paste. Strangely, it was in a single package with a divider, which meant I had difficulty putting in just half of the seasonings like I usually do. 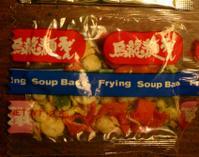 Nevertheless, the soup flavor was quite a treat - spicy and flavorful with hot oil bubbles. Didn't taste much like beef though (they never do). Noodles: I wasn't too pleased with the noodles. They took a long time to soften up, didn't absorb much of the soup flavor, and were very chewy. But to their credit, they did keep me full for about 3 hours, no small feat. 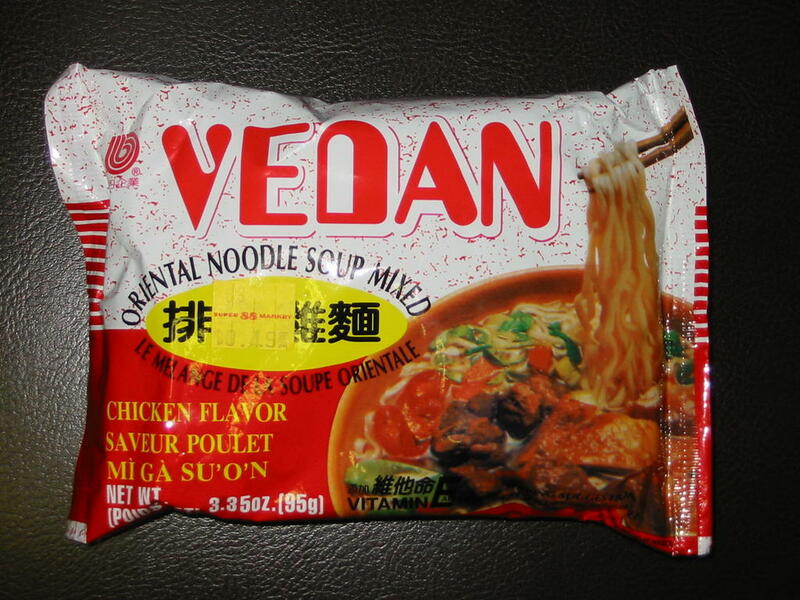 Which leads me to an interesting idea - mixing and matching soup from one package with noodles from another? Ever since moving to the Bay Area, I tend to eat ramen made in an actual restaurant versus the kind out of a packet. Thus, I leave most of the make-it-yourself ramen reviews up to my estimable siblings. My particular area of expertise will be reviews of the great, mediocre and awful ramen restaurants. We start with the best ramen in restaurant in Mountain View - Ryowa. 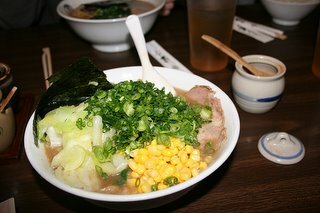 Located right in downtown Mountain View, Ryowa Noodle House is our favorite ramen restaurant in the area. The Original Ramen is generally the safest way to go and the only thing Klint ever orders. It's not too salty, has a slight spicy edge and comes with half a hard-boiled egg and a few thin slices of lean pork. 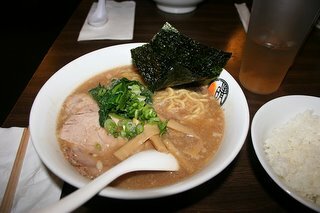 For many months my dish of choice was the fresh-side pork ramen which has a stronger soy sauce soup base comes with a couple large cubes of fatty pork. For a lighter, less-sodium laced meal, try the wonton ramen. It has a clearer broth but still flavorful. Be ready with a backup order because the restaurant often runs out of wontons early. 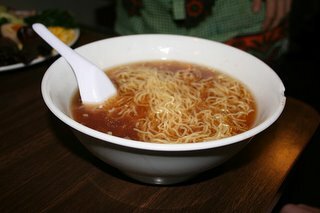 The noodles (which everyone knows makes or breaks the ramen) are generally well-cooked, tender but still a little chewy and very plentiful. The restaurant has strange seating, with most patrons seated around two u-shaped counters. There's a weird shelf that runs below the counter that prevents anybody from sitting comfortably, but your food comes pretty quickly so the pain is bearable. Ryowa also offers complimentary kimchee and cold tea. Ryowa is always crowded so be prepared to wait if you decide to go around lunch time. If you can manage to find a spot inside to wait, entertain yourself with the Japanese TV and the random golf pictures decorating the walls. This is a place for ramen lovers to keep track of which kinds of ramen are good and why. With seemingly hundreds of varieties to choose from, it's hard to keep them all straight! Remember to post name AND flavor. Happy Ramen Eating!